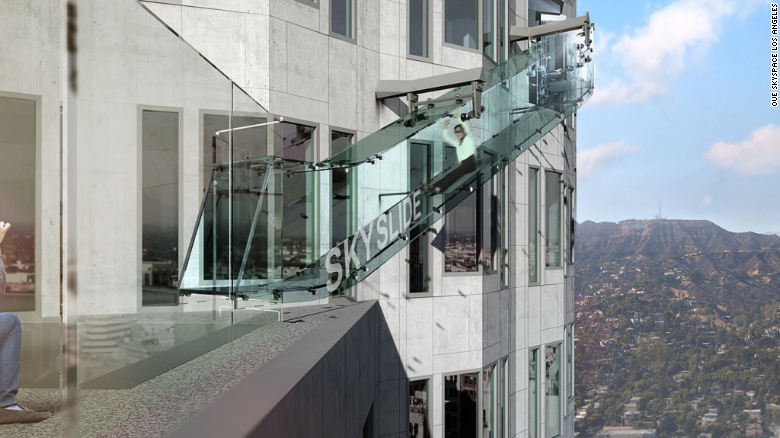 Skyslide, a glass enclosed slide that spans 45 feet across, high above Los Angeles, will open in the U.S. Bank Tower this summer. The slide is part of Skyspace LA, a multi-level experience that will spread across four different floors of the skyscraper, reaching 1,000 feet on the tower’s 70th story. The slide, the premiere draw of Skyspace, will be made of clear glass that’s 1.25 inches thick. In addition to the slide, Skyspace will also host an open-air observation deck. It will be California’s tallest and have panoramic, 360-degree views of Los Angeles.